The latest sheet from Rising Decals is the fourth set to provide markings for the Mitsubishi Zero in 1/72 scale. RD72074 contains decals for no less than 14 very interesting subjects across a range of variants and colour schemes. A6M2 'Rai-112' or 'Rai-152' of 256 Ku at Shinchiku, Taiwan in February 1944 - in classic Nakajima factory finish of dark green over grey with a yellow lightning bolt and character 'Rai' (Thunder) in red and white to provide a splash of colour. A6M3 Model 32 'T2-133' of 204 Ku at Munda, New Guinea (sic - should be New Georgia) in 1943 - in overall amber grey Mitsubishi factory finish with black tail code, yellow tail stripes and yellow fuselage band. This aircraft has long barrel cannon in the wings. A6M5a "43-136" of 343 Ku at Orote, Guam in June 1944 - in badly worn Nakajima factory finish with yellow tail code and stripes. This subject provides the opportunity for worn paintwork Zero fans to indulge themselves without straying too far from reality. But without the reference photo it will be guesswork! A6M2 '2-185' of 582 Ku over the Solomon Islands in 1943 - another overall amber grey bird with the interesting white cowling stripe seen on some Zeros around this time, white-bordered fuselage hinomaru, with red tail code and fuselage chevrons. A6M2 'B1-12' of 381 Ku in Malaya, 1945 - Nakajima factory finish. This is one of the well-known ATAIU-SEA tested aircraft and was fitted with long barrel wing cannon. Another opportunity to indulge weathering and wear experiments. Unfortunately the actual decal has been misprinted as B1-01' which belonged to an ATAIU-SEA Raiden! A6M5c '721-164' of 721 Ku at Miyazaki, Japan in February 1945 - in standard Nakajima factory finish enlivened by white tail code, tail stripes and wingtips. A6M5a 'Rai-153' of 256 Ku at Malbalacat, Philippines in October 1944 - in standard Nakajima facory finish with white tail code. A6M3 Model 22 '162' of 251 Ku at Rabaul in May 1943 - overall amber grey factory finish with dark green "trellis" field-applied camouflage, white tail code, tail stripe and twin diagonal fuselage bands. You are on your own for the upper wing pattern! A6M2 'OTa-1190' of Oita Ku in Japan, early 1944 - another most unusual subject in Mitsubishi-style factory finish with extensive areas of white paint, spinner, cowling front, tail fin/rudder and tailplanes. 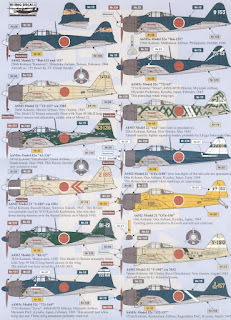 A6M2 'OTa-150' of Oita Ku in Japan, 1943 - splendid in overall orange-yellow with black tail code painted on a white band and unusual cowling anti-glare demarcation. 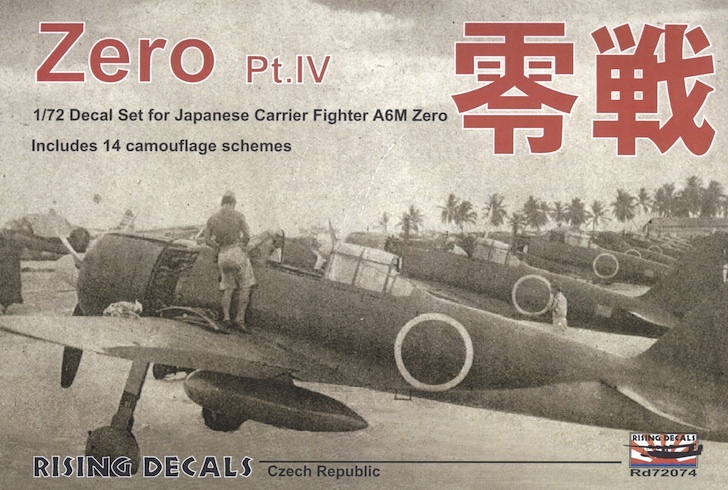 The modeller will need to fabricate the exposed tail wheel assembly but Czech Master Kits do provide neat resin accessory sets for that, designed for the Hasegawa and Tamiya kits. A6M3 Model 32 'V-190' of Tainan Ku's Buna Detachment, in New Guinea, August 1942 - in overall amber grey factory finish with black tail code, white tail stripes, black diagonal fuselage band and Houkoku presentation legend. A6M5c '352-157' of 352 Ku at Kasanohara, Japan, in March 1945 - in standard Nakajima factory finish with yellow tail code and white diagonal fuselage band. There is plenty for Zero enthusiasts to get their teeth into here, offering a great selection of colourful subjects. The packed sheet includes a selection of hinomaru with or without white borders as well as some basic stencilling. 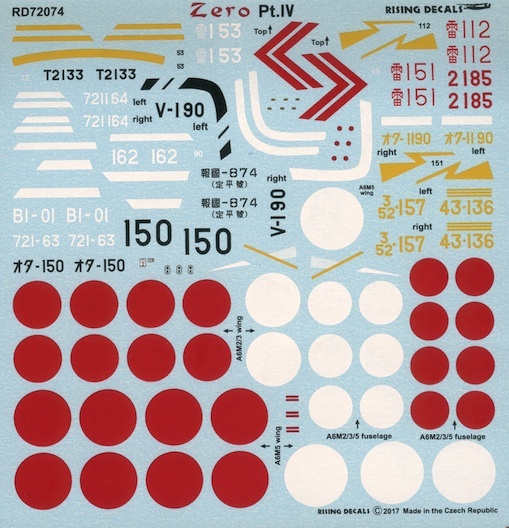 Inspiring decal sets like this one can also be used to dress up older kits, even giving them a new lease of life. With thanks to Mirek of Rising Decals for the review sheet. I wonder if "A6M3 Model 32 'T2-133' of 204 Ku at Munda, New Guinea in 1943" in Munda, Solomon Islands, or Buna, New Guinea, though I suspect the former. I didn't know the lattice-work A6M was and A6M3. Neat! It should be Munda, New Georgia - Solomons. Great selection of Zero markings! There appears to be a mistake with the decals supplied for the airframe B1-12. The decal supplied, B1-01, is the tail code of a J2M3, also used for ATAIU-SEA testing. Thanks Alex and well spotted! I missed that completely! I'll amend the review and hopefully Rising will provide a correction sheet idc.